NE Assistant Director of Sports,Mr.K.W.Wimalarajah, inaugurating the three day-training programme for ten newly recruited sports coaches to be posted in the northeast after training. 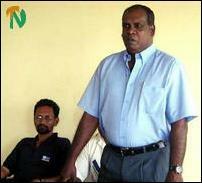 National Coach for football, Mr. Abeyaratne is also seen. The ten coaches who have been undergoing training would be posted to the districts of Batticaloa, Amparai and Trincomalee districts with effect from January 1 next year. Batticaloa and Amparai districts would get two coaches each and Trincomalee district would get five. One coach would be appointed to the provincial department of sports, which is located in Trincomalee, ministry sources said. The cadre for coaches in the NE provincial department of sports is 40. But with the newly recruited coaches, 13 have been working in the province and still there are vacancies for 27 coaches. Provincial sports ministry sources said that sports activities in the North East province have come to a standstill because of the dearth of sports coaches. National coaches for football and athletics, Mr.W.Abeyaratne, and Mr Sajitha Jayalath, respectively, have been in charge of the training programme, provincial sources said.